Stephen Davidsons book shows the master at work, the book takes a look at Joeys career and the pictures are of an extremely high standard. 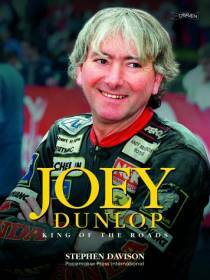 This is a must buy for any Joey Dunlop Fan. This is perhaps one of the most moving books I have ever read. Stephen Davison's photographs of Joey at work and rest reveal the real man behind the legend, and his text beautifully sums up the triumphant career and lasting legacy of one of the world of sport's real legends. Moving, inspiring, and tremendously well-produced, this book deserves all the success it has already achieved and more!